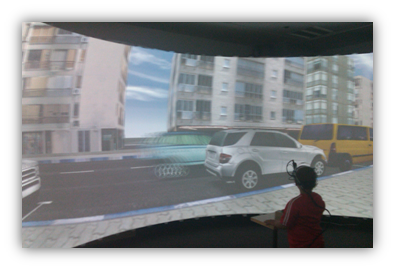 Our new publication “Towards understanding child-pedestrians’ hazard perception abilities in a mixed reality dynamic environment” co-authored by Anat Meir and Yisrael Parmet is now available on Transportation Research part F.
This is our first published study on child pedestrians where we utilized our Dome projection facility. See also a link to our video about the dome pedestrian simulator facility. Child-pedestrians, especially those in the age range of 5–9-years, are amongst the most vulnerable road users. These youngsters are highly represented in fatal and severe injury road crashes, despite relatively low levels of exposure to traffic. The present research investigated child and adult pedestrians’ perception of hazards utilizing a crossing decision task. Twenty-one adults (20–27 years-old) and twenty-five young-children (eight 7–9-year olds,five 9–10-year-olds and twelve 10–13-year-olds) were requested to observe traffic scene scenarios presented in a mixed reality dynamic environment simulating a typical Israeli city from a pedestrian’s perspective, and to press a response button whenever they assumed it was safe to cross. Results have shown that as pedestrians’ age and experience level increased their attentiveness towards potential hazards increases and their ability to anticipate upcoming events while engaging in a road-crossing task was enhanced. Furthermore, both the 9–10-year-olds and the 10–13-year-olds presented a less decisive performance compared to both the experienced-adult pedestrians and the 7–9-year-olds. Understanding child-pedestrians’ shortcomings in evaluating traffic situations may contribute to the effort of producing intervention techniques which may increase their attentiveness towards potential hazards and pave the way for reducing their over-involvement in road crashes. Implications for training novice road users will be discussed. 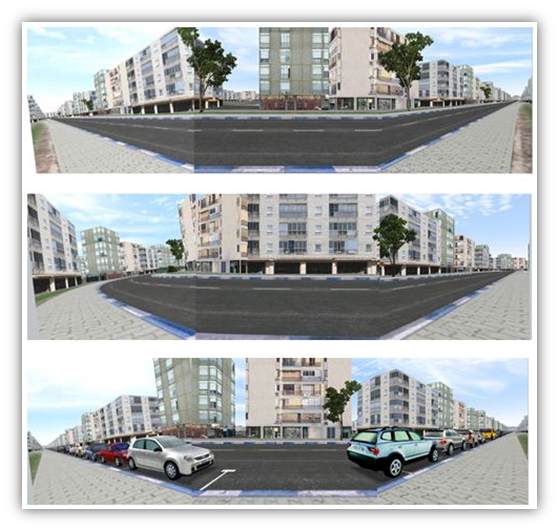 Our 3-D environment was specifically designed (B-design) for walking road users, as it provides high level of detail necessary for a walking person (i.e., not the entire urban model is built, the emphasis is on the façade). Using a 180 degrees large dome allows the feeling of immersion. A sample of a crossing scenario eye tracking pattern of a young pedestrian can be seen in the following video. Note the amount of time that the child spend viewing the cross walk itself rather than the road. My Ph.D student Hagai Tapiro is responsible for the production of this video. A young child pedestrian’s eye scanning pattern in a crossing task. BGU pedestrian simulator. We have just completed this study. Analysis of results and full report are being prepared. The objective of the research is to lay the foundations for examining whether training child-pedestrians’ HP skills while crossing a road may improve their ability to perceive potentially hazardous situations and to predict hazards prior to their materialization. A first step in developing a training program is to form understanding of child-pedestrians’ traffic behavior patterns. Comparing adults and children provides a depiction of what elements in the traffic environment are crucial for the road-crossing task. In the present study, children and adults participant in a two-phase experiment. They observe typical urban scenarios (see Figure 1) from a pedestrian’s point of view (see Figure 2) and a required to: (1) Press a response button each time they feel it is safe to cross. (2) Describe the features that they perceive as relevant for a safe road-crossing decision, i.e., the conceptual model each group of pedestrians has. Participants’ eye-movements were recorded throughout the experiment utilizing a helmet mounted tracker (Model H6-HS, Eyetrack 6000). To achieve this a three dimensional database of a prototypical Israeli city was built in cooperation with b.design (http://www.b-d.co.il/) , a leading provider of 3-D content. Cars, trees, billboards and various other urban elements were also designed uniquely for this environment. Using the VR-Vantage and VR-Forces different scenarios were developed to examine crossing behavior at various conditions. Figure 1. 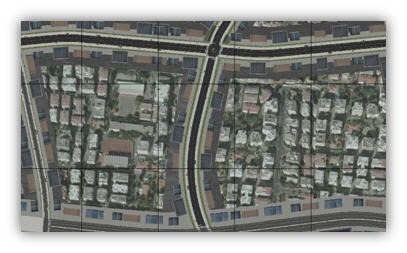 The generic city simulated environment presented in the Dome setting (it looks a bit awkward here because its intended to be projected on a dome screen). The Field of View is: (1) Unrestricted (above); (2) Partially obscured by the road’s curvature (middle); (3) Partially obscured by parked vehicles (below). Figure 2. Simulated environment from a child-pedestrian’s point of view.